Flowing from Cornwall’s central granite ridge, approximately 250 meters above sea level, the River Cober runs down through a varied landscape before meeting Helston, into Loe Pool and finally joining the Atlantic beneath Loe Bar. 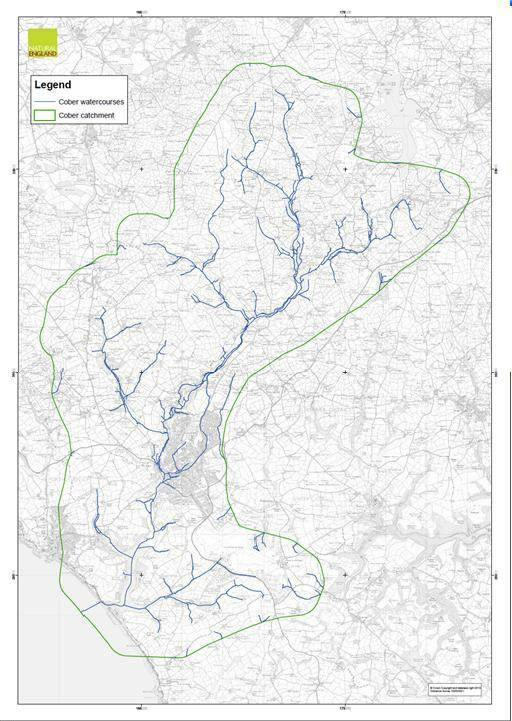 A detailed map of waters journey through the catchment can be downloaded here: River Cober watercourses and catchment boundary. The rich and varied history of the area makes it almost impossible to sum up in a few paragraphs. So what follows is an account of the past and present activities in the catchment in relation to their affect on water quality and flooding risk. Mining in the Cornwall: Cornwall’s geology is ancient! Some rocks, found on the Lizard peninsular, were formed as far back at as the Pre-Cambrian period over 600 million years ago. As these rocks eroded minerals and metals were washed out onto the moors and into the river valleys forming rich deposits. Since 1800 BC Cornish communities have been mining these deposits. Mining in the catchment: The landscape north of Helston is one of the oldest mining areas in the county. 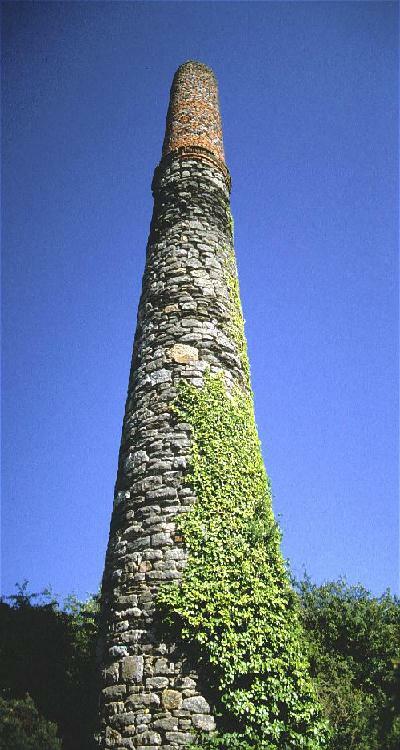 In 2001 a Mortar Outcrop was discovered in the car park of Poldark Mine which is evidence of tin production over 2,000 years ago. The Wendron area, north of Helston, was particularly lucrative for miners because of the way the valley narrowed and meant the largest concentrations of metals were deposited. Up until 1939 thirty mines operated in the Cober catchment but profitability in a global metal market forced closures. More about mining: If you would like to know more about the mining in the area then visit Poldark Mine or have a read of their account of the mining history in the Wendron-district and the Poldark-mine-geology. This West Briton article on ‘Helston as the mining metropolis of the West’ is also very informative. Mining and the environment: The mining activities had, and still has, considerable environmental impact on the watery environment. The Cober carried mine waste comprising of sands, silts and tin slimes, which were ultimately deposited on the Cober flood plain, delta and bed of Loe Pool. This was particularly intense from 1920 to 1938, when the lake was virtually being used as a settling pond. Porkellis Mine stopped operating in 1938, possibly following pressure from the Rogers family. They owned many of the mining rights in the Wendron and Porkellis area, and had objected for many years to the levels of pollution in the Loe. The family is said to have bought up the remaining mining rights to prevent further mining from taking place. The increase in alluvial deposition from mining sediments led to a reduction in lake area with 80 cm of silt being deposited in the last seven years of mining operations. 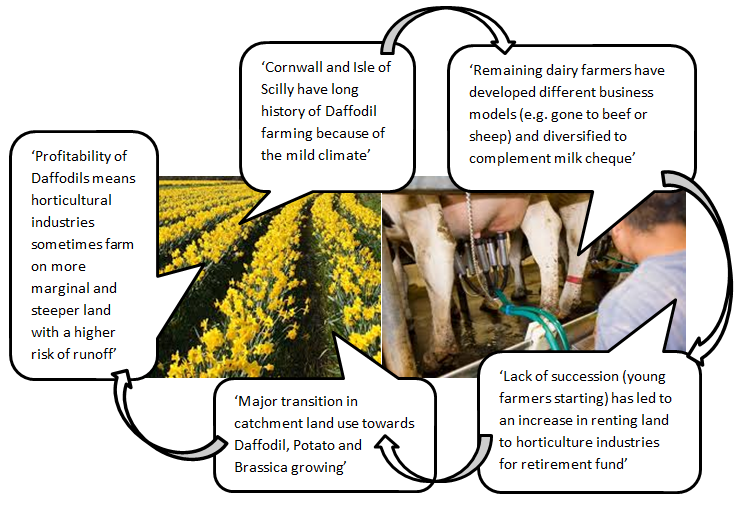 Cornwall’s changing agricultural economy: The agricultural economy in Cornwall has changed markedly since the Second World War. These changes have been driven by the opportunities and challenges of the Common Agricultural Policy (CAP), improvements in science and technology, and increasing globalisation of food markets. The principle developments have been specialisation, intensification and more recently diversification. 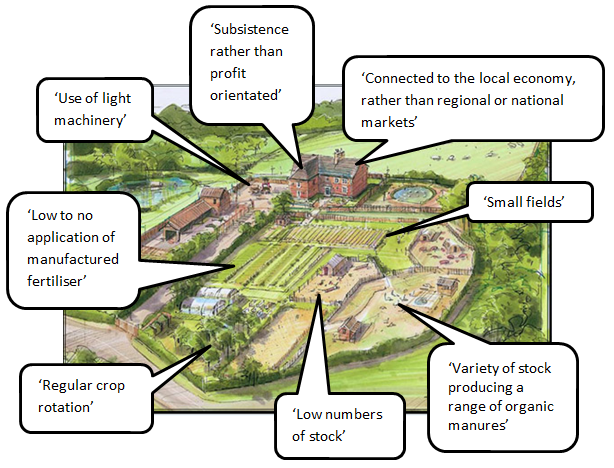 Specialisation is where regions, or farms, with competitive advantages concentrate on one type of product (e.g. a particular crop or stock). Intensification refers to the rising levels of inputs (e.g. fertiliser, animal feed etc.) and outputs (e.g. product quantity). Diversification is where farmers turn to other forms of income outside ‘traditional agricultural’ and reallocate resources into a different type of enterprise (e.g. tourism, festivals etc.). 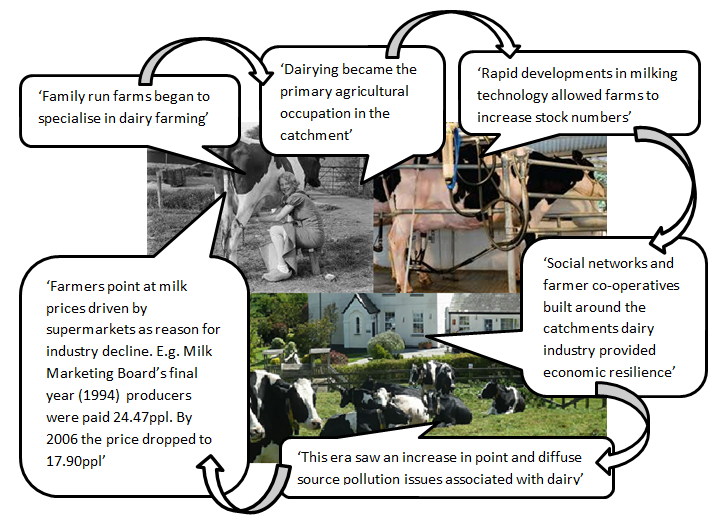 The story of agriculture change in the catchment: In the following section we describe how the Cober Catchment’s agricultural economy has changed through since the Second World War and what this has meant for the environment. There is no published literature on local agricultural change. The following account is based on findings from Timothy Walker’s PhD research. Timothy interviewed thirty farmers in the catchment about land use change, water management and pressures from climate change. The farmers described three eras (their Grandfathers Farm, Fathers Farm and Current Farming) in which different types of farming systems were economically sustainable. Located at the bottom on the catchment is the fascinating town of Helston. The story of Helston’s history is earnestly told through the pages of this site: Helston History.